With this 8GB Digital USB Sound Voice Audio Recorder in hand, never miss your important conversations!It is your best helper to record and store your conversations, lectures, discussions, meetings and many more. This digital USB voice recorder is 2 in 1 function (USB memory stick+Digital Voice Recorder) makes this voice recorder a perfect pocket-sized way to record discreetly or covertly. 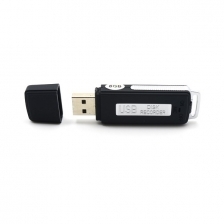 This Digital Voice Recorder features simple one-key recording - no software to install. It also comes with a built-in rechargeable battery. It takes 1-2 hours to charge the battery and will last for 12 hours. · 2 in 1 - dictaphone and USB pen drive. · Support U disk function. · 8GB memory size for long recording. · Support Systems: Windows 2000/XP/Vista/7 and above. Please kindly know that you can't use this item to record when you are charging it or when pluging it in the PC.